The Domestic Life: Cool weather makes me want warm food! Cool weather makes me want warm food! Well, its already Thursday again, Im trying to think up next weeks dinners. As well as tonights! Since it was a cool 62 degrees this morning, and should be about the same tonight, I am really wanting some nice fall foods. Im thinking chili and baked potatoes, stuffed shells, something that is just warm and comforting. It would have been a great day to attempt using a crockpot, if only I had prepared for it. I am thinking of doing an around the world theme for dinner next week. I got some great light chinese food recipes (I have been craving it like nothing else lately!) and may attempt fish tacos and some sort of pasta. I have come around on the ronzoni smart pastas! Although I guess none of these would follow Erins suggestion of cutting crabs out at night, but it's not like Im eating them all day so one serving should be allowed. At least Im not going for Adams amazing grilled potatoes! Those things are so great, definitely a bad carb though. Mmmmm. (It is great to have someone to play sous chef to).Off to the blogs for more ideas! 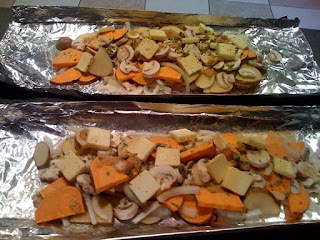 Mix all together in foil, place butter pads on top and add another layer of foil on top. Put on grill for 40 minutes, shaking about half way through. You need to eat carbs at lunch, then not at dinner, the point is you dont want to sleep with heavy food, so lunch should be a bigger meal than dinner is.